Send your kids back-to-school without all their much needed supplies? ¡Que escándalo! As a former Special Education Teacher I can tell you it's the bane of a teacher's existence when students show up un-prepared for class. It's not only annoying, it's incredibly costly, for the teacher. Most public schools don't offer a full range of classroom supplies leaving it up to the teacher to supply their own classrooms on incredibly meager salaries! And while I realize times are hard all around, and it takes a village, it is super difficult for teachers to shoulder the burden by themselves. I personally think they shouldn't have to, but that's certainly a post for another time. What if you could make a small addition to your shopping list that would not only promote healthy kids and healthy classrooms but also help support the amazing Box Tops for Education Program, would you do it? Of course you would! Who wouldn't? 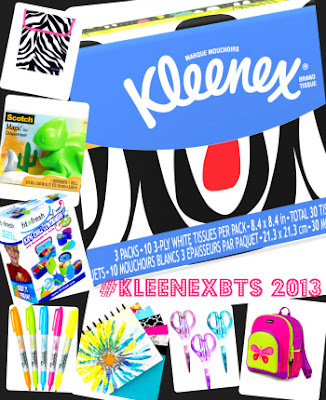 Did you know that Kleenex is the ONLY facial tissue brand that participates in Box Tops for Education? And to date, the Kleenex Brand has donated $13 million to the Box Tops for Education Program (since 2006). Box Tops Coupons are found on over 240 participating products! I can tell you that this alone makes me want to run out and stock up, I know how under-funded the schools are in my district, and I currently participate in the Box Tops for Education program and buy as many products that participate in the program as I can. If the children of today are our future, shouldn't we do all we can to ensure their success? This year, the iconic tissue brand that has always been synonymous with Back-to-School for me both personally and professionally, gets a hi-tech makeover with 'Sneeze Shield', they are thicker and more absorbent which helps to keep wet stuff off hands, which helps to fight school germs! A single sneeze can travel 100MPH and send 100,000 germs into the air, um no thanks! But since it's best to let a sneeze happen and not so healthy for you to supress it, at least Kleenex with Sneeze Shield offers a barrier that helps keep your child, the air and the classroom a bit more germ free! Supporting a brand that is supporting students, classrooms and teachers is a total no-brainer! Kleenex Wallet Packs, and the classic on the go Kleenex Everyday Tissue Packs with Sneeze Shield are the perfect size to slip into a bookbag. And since we know that an ounce of prevention is worth a pound of cure, don't wait until your child catches a cold, even if they aren't allergy prone, it's always helpful to carry Kleenex on the go! Three Cheers for Kleenex ( that's a company that care's ) .Teachers put so much into our kids that if buying a few extra packs of Kleenex on the go and other supplys to help out in the classroom why not !! I know that I'll be doing my share to help, thanks for getting the word out !